I once said I would not buy a Mazda since I couldn't stand the Zoom-Zoom kid in their commercials. Well, Missy and I bought a Mazda6 last year. Now, I've gone and done it again by buying something I never thought I would own: a product made by Dell. 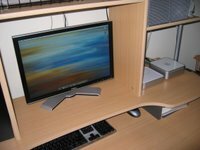 I replaced my original grey 15" Apple Studio Display with a Dell 20" widescreen 2007WFP display. It's technically the same LG display that's in the Apple Cinema Display, but for a much cheaper price. Plus it has some additional S-video, composite, and VGA inputs that allow for PiP and allow the display to function without a computer (hello Xbox 360 on my desktop). Add to that a pretty good deal on Amazon, and there you have it. I've become a sellout again. Oh well. At least the display is still showing Mac OS X and not Windows.